Following the deadly school shooting at a Newtown, Conn., elementary school, President Obama may now be poised to push for new gun control measures after keeping relatively quiet about the issue during his first term. In an emotional statement from the White House on Friday, Obama said the violent massacre -- the second deadliest school shooting in U.S. history -- instilled "overwhelming grief" and heartache, and that the country has "endured too many of these tragedies in the past few years." "We have been through this too many times, whether it's an elementary school in Newtown or a shopping mall in Oregon or a temple in Wisconsin or a movie theater in Aurora or a street corner in Chicago," he said of the other mass shootings in the past year alone. "These neighborhoods are our neighborhoods, and these children are our children," Obama said. "We're going to have to come together and take meaningful action to prevent more tragedies like this, regardless of the politics." 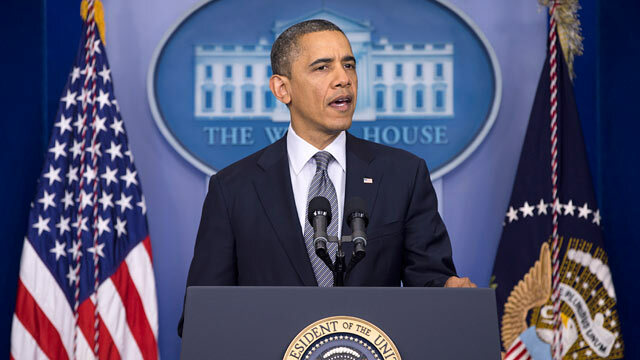 The statement is a subtle but marked shift for Obama, who has not made gun control a priority during his presidency in spite of at least five major mass shootings that have occurred on his watch -- Binghamton, N.Y. (2009); Fort Hood, Texas (2009); Tucson, Ariz. (2011); Aurora, Colo. (2012); and Oak Creek, Wisc. (2012). The White House has said that Obama cannot act alone and that there is little appetite in Congress to enact new gun laws. Obama had also been seen as loathe to revive a public gun debate ahead of the 2012 election campaign. But with the latest tragedy, the tide may be turning. A bipartisan coalition of lawmakers, public figures and activists wasted little time Friday amping up pressure on the administration, including a hastily organized protest outside the White House gates. "The country needs [Obama] to send a bill to Congress to fix this problem," said New York City Mayor Michael Bloomberg in a statement after the Newtown attack. "Calling for 'meaningful action' is not enough. We need immediate action," he said. "We have heard all the rhetoric before. What we have not seen is leadership – not from the White House and not from Congress." Former Astronaut Mark Kelly, husband of Rep. Gabrielle Giffords who was shot in Tucson last year, called on lawmakers and the president to "stand up and do what is right." "This time our response must consist of more than regret, sorrow, and condolence," he said in a statement on Facebook. "This can no longer wait." Obama signaled in October during the second presidential debate that he is ready to take new action on gun control, including reintroduction of an assault weapons ban. A 10-year federal ban on the sale of some semi-automatic weapons -- dubbed "assault" weapons -- expired in 2004 and has not been renewed despite several attempts. Obama in 2008 said he would push for renewal in his first term, but that effort never materialized. "Weapons that were designed for soldiers in war theaters don't belong on our streets," Obama said in Hempstead, N.Y., on Oct. 16. "So what I'm trying to do is to get a broader conversation about how do we reduce the violence generally. Part of it is seeing if we can get an assault weapons ban reintroduced, but part of it is also looking at other sources of the violence." The president has not mentioned gun control in any of his State of the Union addresses, including the 2011 address just days after the Tucson shooting. Meanwhile, his administration has expanded gun rights in some areas, allowing possession in national parks and on Amtrak. He has also backed off a 2008 campaign pledge to push for permanent reinstatement of the expired assault weapons ban. The Brady Campaign to Prevent Gun Violence, a nonprofit advcoacy group, in 2010 awarded Obama an "F" on gun control, citing "extraordinary silence and passivity." In his few public statements on guns, Obama has sought to balance support for Second Amendment rights while emphasizing enforcement of existing laws and a national background check system rather than new controls. "I, like most Americans, believe that the Second Amendment guarantees an individual the right to bear arms. And we recognize the traditions of gun ownership that passed on from generation to generation," Obama told the National Urban League in July. "But I believe the majority of gun owners would agree that we should do everything possible to prevent criminals and fugitives from purchasing weapons; that we should check someone's criminal record before they can check out a gun seller; that a mentally unbalanced individual should not be able to get his hands on a gun so easily," he said. He made no mention of new legislation or initiatives to boost enforcement of existing laws, saying only that communities and government officials needed to "convene conversations" and build consensus. "Steps to reduce violence have been met with opposition in Congress. This has been true for some time -- particularly when it touches on the issues of guns," he said. President Obama has been widely praised for his empathetic response in the immediate aftermath of the shootings that have occurred on his watch, assuming the role of "consoler-in-chief," as have his predecessors. But gun control advocates have been frustrated with his continued reluctance to publicly advocate for any legislative measures, including a ban on assault weapons or high-capacity ammunition magazines, to help prevent future tragedies. "How many more Columbines and Newtowns must we live through?" said Rep. Jerrold Nadler, D-N.Y., a leading gun control advocate in Congress. "I am challenging President Obama, the Congress, and the American public to act on our outrage and, finally, do something about this." The Aurora, Colo., movie theater shooting in July 2012 was the largest mass shooting in U.S. history with 71 people hit by bullets; 12 were killed. The Newtown, Conn., shooting today is the second deadliest in U.S. history, with more than 28 dead. A shooting at Virginia Tech in April 2007 was the deadliest shooting in U.S. history with 33 shot and killed, including the shooter.